Free Education by IIT Ramaiah People's Progress Trust Entrance Test 2019 Results Selection List download http://peoplesprogresstrust.com/ : Free Education and Accommodation for Poor Children under the People's Progress Trust IIT Ramaiah People's Progress Trust Entrance Trust 2019 exam connducted on 26 April 2019 Results selectiojn List download , IIT Ramaiah People's Progress Trust Entrance Trust 2019 Selection list, IIT Ramaiah People's Progress Trust Entrance Trust 2019 Results, People's Progress Trust Entrance Trust 2019 Final selected list. District wise Progress Trust Entrance Trust 2019 Results, Progress Trust Entrance Trust 2019 Districts Results. 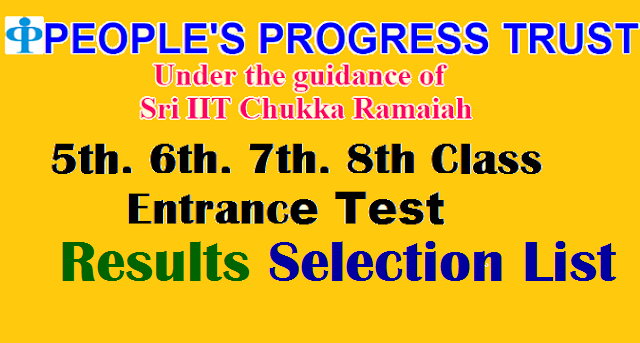 Shri IIT Chukka Ramaiah People's Progress Trust 5th, 6th, 7th, 8th Class Entrance Test Results.Free Education to Poor/ Economically Background Students by Peoples Progress Trust ( Under the Guidance of Sri IIT Chukka Ramaiah) Entrance Test 2019 | Sri IIT Chukka Ramaiah Peoples Progress Trust Entrance Test 2019 for Economically backward students to achieve Free Higher Education results details are available here. Shri IIT Chukka Ramaiah Peoples Progress Trust Entrance Test 2019 for Economically backward students to achieve Free Higher Education: IIT Ramaiah People's Progress Trust Entrance Trust 2019 results are declared on 12 May 2019 and district wise selected candidates list are placed on its web portal: http://www.pragathiresults.com/. IIT Ramaiah People's Progress Trust issued the Entrance Trust 2019 notification in April month and 5th,6th,7th,8th Class entrance exam was held on April 26. Provide the Free education and accommodation for poor students in Telangana by Chukka Ramayya People Progress Trust. This year, 350 students will be provided with free education and accommodations. On April 26th, the District Centers conducted a written test. This trust, which was established in Pragati Nagar in 1995, is offering education and medicine free of cost. The People's Trust is being conducted with a social perspective without any labeling. Socially speaking, there are people who have been educated and hosted for free and backward students.